Treat your garden-loving friends or family members to horticulture-inspired gifts and Christmas cards from the National Garden Scheme – and all proceeds will help support nursing and health charities such as Marie Curie, Hospice UK and Carers Trust. Inspire a year of garden visiting with the Garden Visitor’s Handbook 2019 – the essential guide to over 3,500 gardens opening for the National Garden Scheme next year. With detailed descriptions of every garden, stunning photos, and handy maps and calendars, all of the information you could possibly need to visit a beautiful garden is right at your fingertips! Pre-order the handbook as a Christmas gift and you’ll receive a printable gift voucher to give to your loved one, letting them know they’ll receive the Garden Visitor’s Handbook 2019 hot off the press in February 2019. Send festive cheer to your friends and family with the National Garden Scheme’s range of three Christmas cards, all featuring beautiful National Garden Scheme gardens in winter. 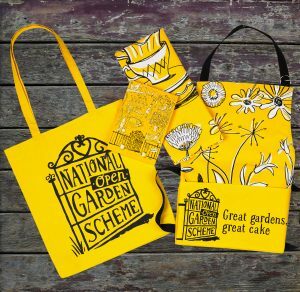 Whether you’d like to inject some colour into someone’s kitchen with the National Garden Scheme apron and tea towel, add to their stationery collection with a beautifully illustrated notebook or help them transport plants home from a garden visit with a canvas tote bag – your loved one will be sure to treasure one of the National Garden Scheme’s quintessentially British gifts. Please note, last order date to receive items in time for Christmas is Monday 17th December at midday.